Notes: "Binkert" at foot of figure grouping.--Recto. 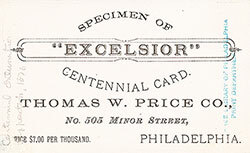 Notes: "Specimen of "Excelsior" centennial card. Thomas W. Price Co., No. 505 Minor Street, Philadelphia. Price $7.00 per thousand." -- Verso of card. 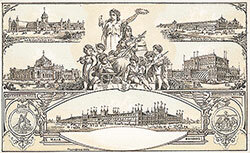 Notes: 1 trade card : 13 x 8 cm. 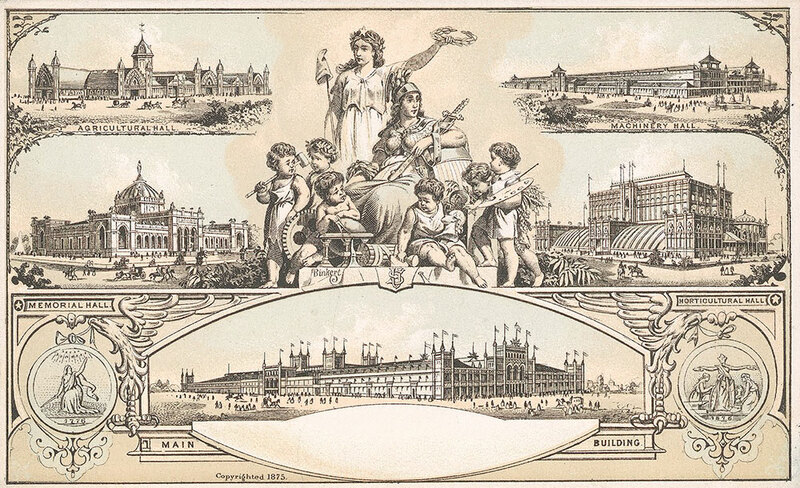 Notes: Trade card for the Thomas W. Price Co. Recto: Agricultural Hall, Machinery Hall, Memorial Hall, Horticultural Hall, Main Building, and figure grouping representing the arts and industrial crafts. Blue, green and yellow tint on white card. Verso: text. Black ink on white card.